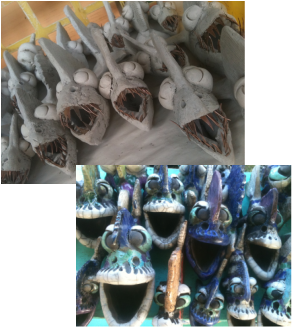 Ross De La Garza, a seventh generation Texan who grew up along the Texas coastline in Corpus Christi began to create these whimsical fish over 20 years ago. 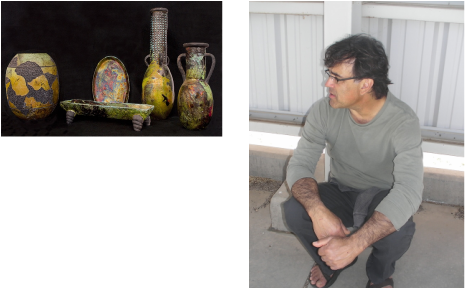 His passion for his craft and the ever growing family of art patrons, keeps him reaching into the kiln with an unending smile on his face and in his heart. Raku is a 16th century firing technique that originated in Japan and was brought to the US in the 50's. The process involves reaching into a kiln at approximately 1800 degrees and removing the pieces while still hot. The glaze at this temperature is melted and the stress of the cooling causes the glaze to shrink on the clay, creating a randomly cracked pattern. Before the pottery cools completely, the piece is placed in a barrel of shredded newspaper that will be ignite on contact. Once a lid is placed on the barrel to kill the fire, the piece absorbs the smoke. The clay glaze and smoke all react to produce the dynamic effect known as Raku. Each piece is unique in expression and design with just the right amount of creative levity and whimsy to instill a joy in the beholder.